This machine adopts touch screen human-machine interface.The machine joins the ends, feeds and bends the aluminum bars automatically under control of PLC system after the size and quantity are input. The cutting ends are connected manually and the two ends are connected on one side instead of the angle, which solve the problem of four angles water and air leakage problems and enhance the life of insulting glass. 1 Human-machine interface adopts WEIN-VIEW touch screen with easy operation system and good performance. 3 Four storage zones can storage four different sizes of 4-6M long aluminum bars. It can process continuously 3 sizes of aluminum bars strictly according to the pre-settings. 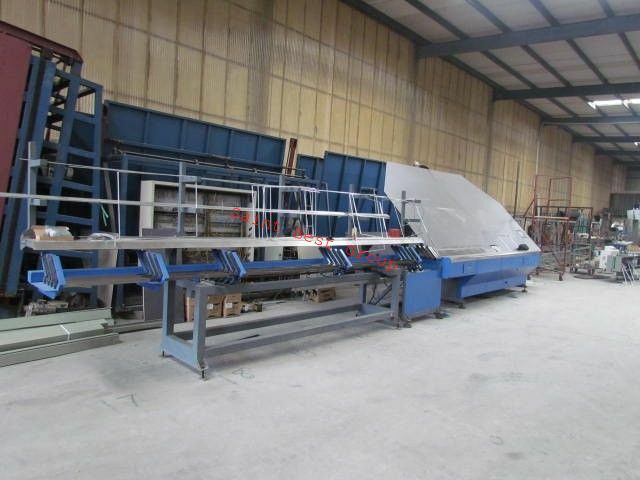 4 The machine feeds the aluminum bars and connects the ends automatically. 5 The aluminum bars are 100% utilized except only the cutting ends are slightly worn off. 6 All the operations go on automatically except the aluminum bars loading and removal of the finished aluminum frames manually. 7 The mechanical structure is rationally designed which is convenient to servicing and maintain. The equipment can be stopped by pressing emergency button when the operation goes wrong. 8 It avoids the connection and roundness of aluminum frames. It cuts the aluminum bar automatically. 9 All the operations are free to switch between manually and automatically which is easy to debug and maintain. 11 This machine can set butyl application thickness for rectangle spacers. 12 It changes cutter automatically. it is no need to change the cutter if the width of aluminum bar is over 6mm.